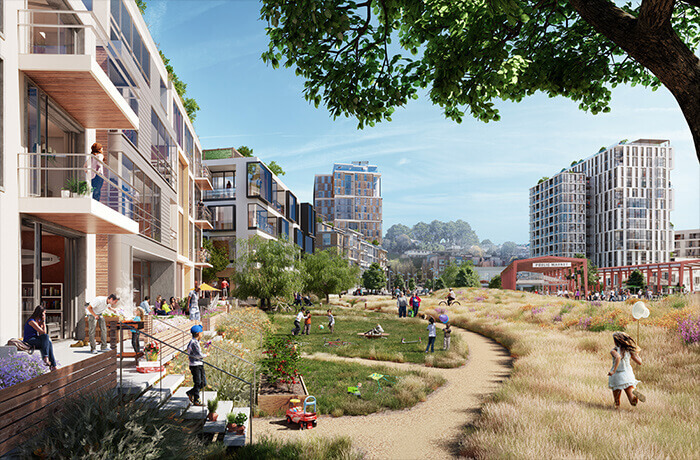 San Francisco's India Basin development plan will create urban amenities that coexist with one of the city's last wild spaces. Courtesy BUILD. India Basin, on the southeast edge of San Francisco, was historically a neighborhood tied to the shipbuilding industry. An unassuming nub poking out into the San Francisco Bay, the 17-acre parcel at 700 Innes Avenue is something of a unicorn: It’s a rare example of undeveloped land (along the waterfront, no less) tucked into one of one of America’s most vibrant and densely populated cities. And it’s a part of a city under serious gentrification pressure. Anyone even cursorily familiar with San Francisco’s crisis of housing affordability won’t be surprised to learn that this formerly industrial neighborhood, one of the city’s poorest, is now subject to a roughly $1 billion development plan. The India Basin plan emphasizes harmony between human and natural habitats. Courtesy Steelblue. Community input boiled down to two essential requests: "Keep the access, and keep it wild." Courtesy Steelblue. 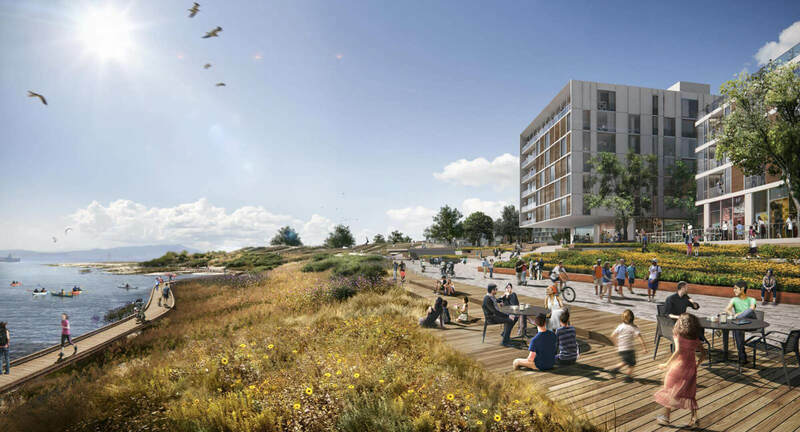 BUILD’s plan brings denser housing to the site and commits to preserving the area’s untamed coastal ecology that residents have come to cherish. Working with local landscape design firm Bionic, BUILD seeks to balance the needs of natural and human habitats—including the creation of a new park that embraces the area’s “diverse values,” says Phil Ginsburg, general manager of the San Francisco Recreation and Park Department. It will feature “wild and woolly” ecology, he says, along with new park programming and urban amenities. Since the neighborhood’s founding in the late 19th century, the tide of shipbuilding industry has long ebbed. BUILD hopes to provide a modern community hub with approximately 1,300 new apartments, with roughly 20 percent of the units offered below market rate. The land itself is the product of its industrial past. Beginning in the 1960s, the site was created from fill taken from highway construction projects and dumped into the bay. Over decades, new earth rose to the surface; more recently, San Francisco’s real estate market burst into white-hot flames, making development on a remote peninsula next to shipyards and a power plant a profitable necessity. Today, India Basin is mostly covered in scrub and grass, bordered by a soft-edged rocky and sandy beach. It’s remained untouched, Pash says, because it’s expensive to install even basic utility infrastructure wholesale into the neighborhood, and neighbors’ requests for ecological preservation have made developers cautious. Bionic’s Marcel Wilson (who used Autodesk’s AutoCAD and AutoCAD Civil 3D to design the project) worked with Ginsburg and the city to boil down the community’s input into two simple bullet points: “Keep the access, and keep it wild,” Wilson says. To this end, Bionic’s landscape plan begins by building up robust habitats for flora and fauna before the habitat is even visible. “We talk about the ecologies going from the mud line below the water, going to the top of the ridge line,” Wilson says. Floating wetlands and living shorelines planted with species that ensure habitats for native wildlife are the first step toward supporting the park’s ecology. The new India Basin landscape grows increasingly wild as it approaches the San Francisco Bay. Courtesy Steelblue. Out among the pickleweed and salt marshes at the water’s edge, Bionic and BUILD have planned a series of elevated walkways that will keep the site viable even as future sea levels rise. 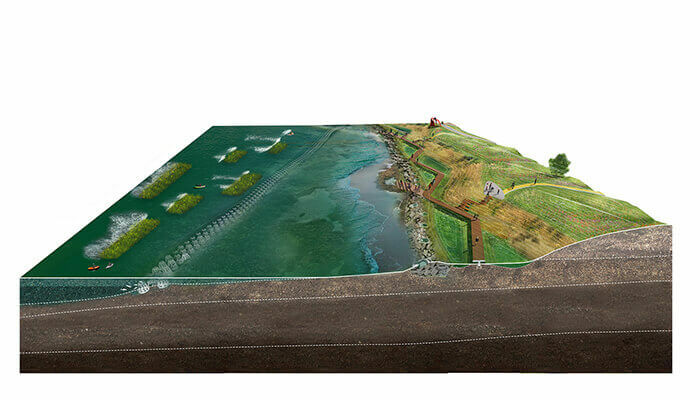 Wilson plans for 66 inches of rising tide by cutting down and carefully sculpting the edges of the land so that there’s a more gradual change in slope, to ensure a slower and more predictable inundation. These elevated walkways (as well as an elevated beach) also offer places for human circulation without disturbing sensitive ecological niches. Perched over the marshy frontier, it’s easy to imagine squawking sea birds and rustling reeds with expansive bay views, all steps from the urban amenities the neighborhood will have no trouble filling with once the infrastructural groundwork is laid and moneyed newcomers move in. Learn about the software Bionic used to design the India Basin project. Because the site is on uninhabited land, this infusion of capital might avoid the tenor of the Bay Area’s worst gentrification fights. But the threat of displacement, and the question of who, exactly, the new park is meant to serve still hang in the air. 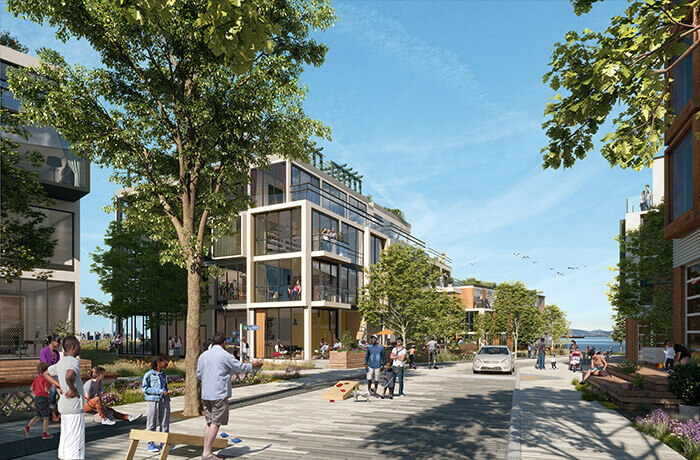 The India Basin Neighborhood Association, whose members live adjacent to the site, wants the park to remain wild, with a strong contextual connection to its history, says Ginsburg. The plan begins below the waterline, hovers over the salt marshes with zigzagging paths, and eventually leads up to the generous decks of the multistory apartment buildings. It sets up an underpinning of ecological engagement, with circulation and congregation spaces created above to protect and appreciate the ecosystem. 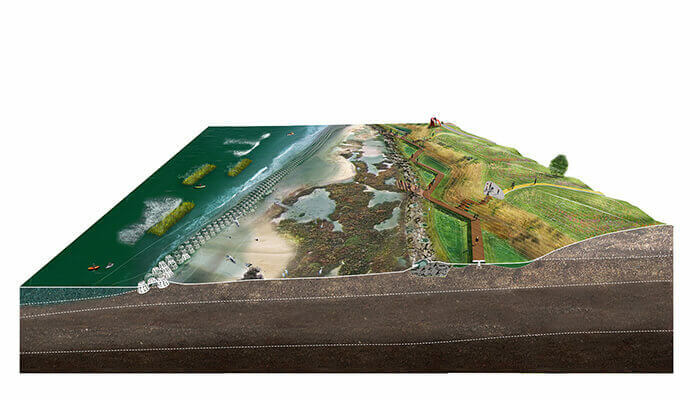 The plan will accommodate tide fluctuation and rising sea levels. Courtesy Bionic. A rendering of how the shoreline might appear in 2050. Courtesy Bionic. How the shoreline might look by 2100. Courtesy Bionic. While the array of landscapes reference the elements on-site today, the water-management system Bionic envisions is tabula rasa. “Because this is essentially raw, created land, we have this really unique opportunity to build all the urban systems on the site,” Wilson says. Storm water will be collected and treated on-site and released directly to the bay, avoiding additional burden on the city’s storm drains. Even more ambitiously, Wilson has planned for the option to treat and recycle wastewater on-site. 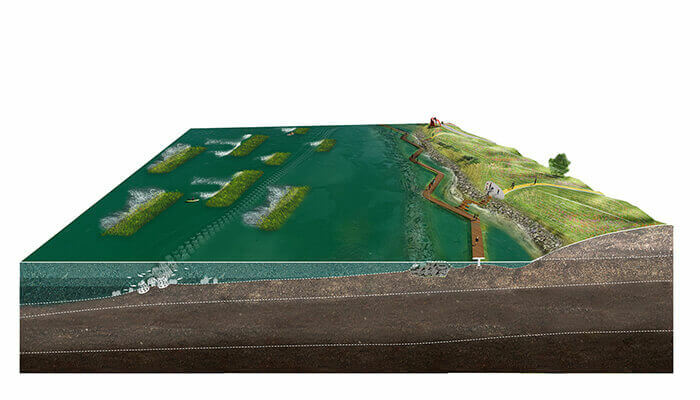 He hasn’t selected a system yet, but Bionic intends to install a vertical-flow wetland system in the open space to help treat the water before moving it on to ultraviolet treatment and reuse. The recycled water can be kept at India Basin or exported for irrigation. “It has the possibility of being its own freestanding utility,” Wilson says.